The ship had taken eons to develop, but she finally managed it. All that remained was to test it, to send it on its first expedition, to venture off bravely where all others have feared to go forth...the great Voids of Space. One could take one quick glance at the R.L.S. Litanum and easily dismiss it as a standard trade ship. That is, if that glance could overlook the huge, irregularly shaped sails and the large metal sections towards the stern of the ship. Heck, it was hard to distinguish which was ship and which was industry, for the central smokestacks rose up about half the height of the massive ship itself, among other strange accessories. But a ship it was, and a ship that Tesmaknup was proud of. She had hired a small crew for the ship, for her automatons were a large part of the vessel's work force, except for her first mate, her galley chef, and the defense systems commandeer. Of course, whether they were coming or not was beginning to worry her, for the ship was very expensive to dock here at the Moonport in Canterlot. She stood at the edge of the pier, and looked over her left shoulder, peering at the crescent-edged shore of the Moonport, and gazing across the short square buildings of the shanties. It was midday, a time of day when the Port was busiest, but today was different. Everypony knew that today either something very great or very tragic was to happen today, in four hours. "Where the hay are they all?..." Tesmaknup was beginning to wonder if her crew was coming at all. Spin Art in a steampunk genre. The outfit was based on my banquet outfit for school. 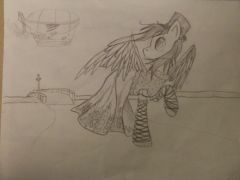 :3 I'm not done with it since I need a steampunk looking town.